It's hard to believe these delectable little tarts are completely free of butter, cream and eggs, as well as flour and refined sugar. In a food processor, process the almonds into a fine meal. Add the dates and process until you have the consistency of a sticky dough. Line 6 tartlet tins with clingfilm. Press a layer of the almond mixture into each, creating a crust about 3mm thick. Freeze for 30 minutes, then carefully lift the crusts out of the tins. While your tart shells are freezing, make the cream by puréeing all the ingredients in a blender. Spoon 1 tbsp of the cream into each tart shell in a smooth layer. 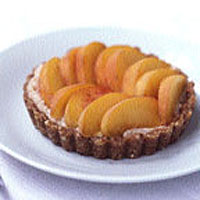 Arrange the peach slices on top of the cream, and serve immediately. This recipe was first published in August 2005.